Korda Carp Rig Barbless 18lb supernatural For instant carping and instant results, you just have to try these Ready-Tied Carp Rigs. Designed and tied to perfection, the most experienced of anglers will have no problem in incorporating them into their angling. Each rig is constructed from either Supernatural Braid or IQ2 Fluorocarbon so whether you're targeting soft or hard lake beds, there's a material to suit. 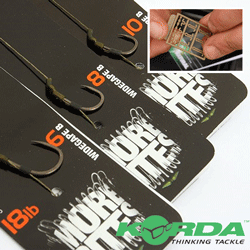 Not only that, each rig comes readily available in a range of hook sizes or patterns. Wide Gapes, Wide Gape B's and Lonshank X's all form part of these wonderful rigs. Each Ready-Rig is presented neatly on a dedicated rig board to keep it straight and safe in transit. Therefore, you know the link will be perfectly in tact, with no kinks, when it comes to actually using it. Now, these are also the first rigs to include dedicated Extenda Stops and Bait Stops in the same package - just enough to keep you going!